Arlington, VA, Sept. 13, 2017 -- The American Feed Industry Association is pleased to announce Joe Saini as its 2017 Liquid Feed Hall of Fame inductee. Left: Joel G. Newman, AFIA Pres. & CEO; Joe Saini & Randy Saini, Quality Liquid Feeds; and T.J. Biggs, Global Animal Products, Liquid Feed CTTE Chair. 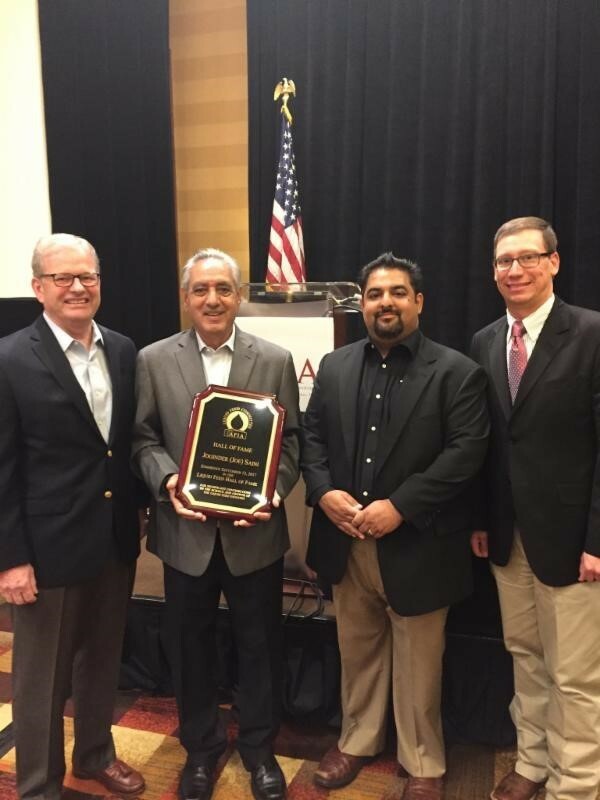 The AFIA Liquid Feed Committee presented the award--the highest award offered within the liquid feed industry--to Saini today during a luncheon at AFIA's Liquid Feed Symposium, being held this week in Louisville, Kentucky. "For more than 45 years, Joe's knowledge and innovative ideas in bulk liquid feed handling, storage and manufacturing has contributed to the growth and continued success of the liquid feed industry," said AFIA President and CEO Joel G. Newman. "Beyond his career accomplishments, he has actively given back to his community to improve education for all." Saini, one of the liquid feed industry's early pioneers, has had a long and diverse career. He currently serves as a consultant to Quality Liquid Feeds, a liquid feed products manufacturer in Dodgeville, Wisconsin, which he co-founded in 1981. Saini served as vice president of operations and procurement for the organization from 1981 until his retirement in 2010. Prior to that, he served as regional manager for National Molasses from 1977-1980 and as director of operations for Illinois Liquid Feed from 1972-1977. Saini grew up on a sugarcane farm in Ralhan, Punjab, India. He received a master's degree in agriculture from Punjab Agriculture University in Ludhiana, Punjab, and immigrated to the United States in 1971. With a group of friends, he also co-founded the Saini School in Ambala, India, which provides education for 700 children living in poverty each year. Saini lives in Peru, Illinois, with his wife Neelam. The Liquid Feed Symposium is the country's largest gathering of liquid supplement leaders in manufacturing, nutrition, quality, sales and marketing. The annual Liquid Feed Hall of Fame award recognizes outstanding individuals in the liquid feed industry, who receive a plaque to commemorate the achievement. Click here to learn more about the award and to view the 18 prior inductees.